(02-07-2018, 11:31 PM)edoardocoen Wrote: I'm on the boat too, now. I'm very exited. This post was very helpfull for me, thank you a lot!!! (01-29-2018, 05:45 PM)Soutron Wrote: Great write up, thanks! I had trouble on the linux wallet section - I could not alter the IP to change it to my own IP any idea what I was doing wrong? so i success set up a skywire..
but i am not in develop list ,,how can i change the address? 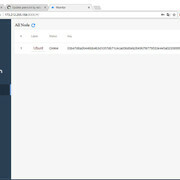 although the testnet is not working ..can i use it as a ssh tunnel now ? Could you give a brief summary of the impact/benefits of this command? I used your guide on one install as well as another guide that doesn't have this on another install and the text outputs when running Skycoin are quite different (this seems to cause timestamps to be printed out, etc?). My understanding at this point is that this isn't the GO version that's needed for an ARM 64 bit board. For Orange PI Boards, I ended up using https://dl.google.com/go/go1.10.linux-arm64.tar.gz instead. I'm trying to install your scripts to autoboot but i can t manage to make them work. I set up on my orange pis the pure image from the github (i'm a lazy guy!!) and i made the update with the new version of skywire. Could it be a problem coming from the version of debian used in this image that prevents me to run your script? I'm looking for a guide that helps me set up a node on a linux device that's NOT an orange pi or rpi. Is this suitable? if not where should i go to? appreciate all the efforts, maties! Question: is there a way to keep the node running even after shutting down the computer that's used to launch and run Putty? Current time: 04-20-2019, 01:00 AM Powered By MyBB, © 2002-2019 MyBB Group.